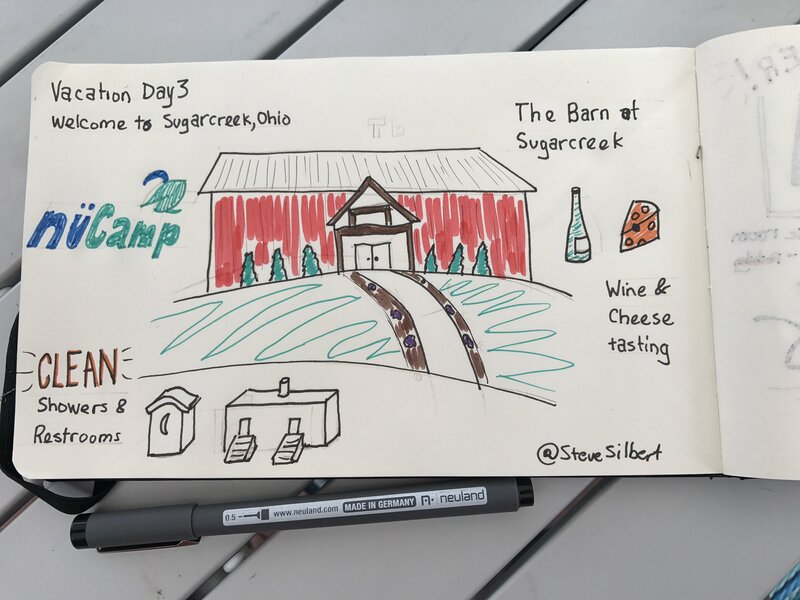 Last week I was on a week-long trip to Sugarcreek, Ohio, home of the nuCamp RV manufacturing facility. 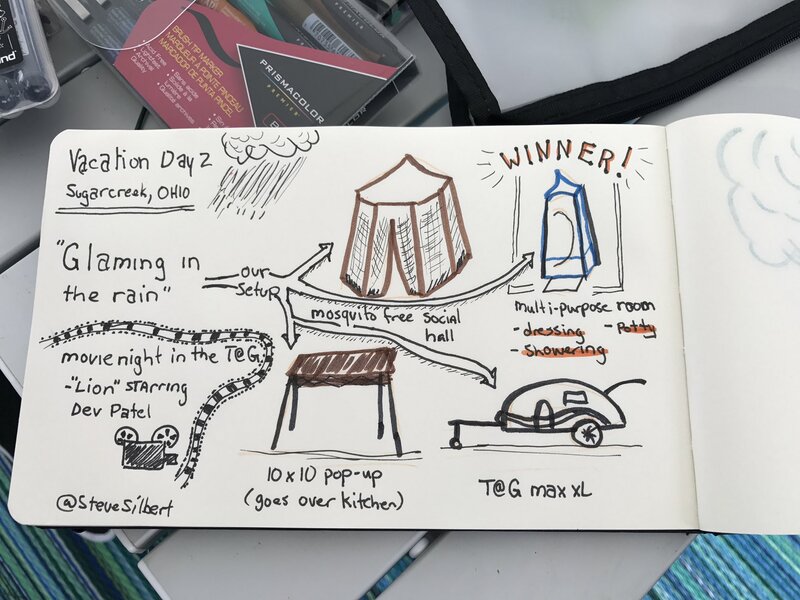 The event was called uCamp17, with nuCamp teardrop RVs from around the US and Canada arriving at the Winklepleck Grove Campground in Sugarcreek. 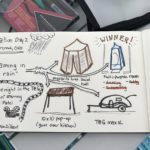 Activities hosted by nuCamp were set up every day and in between we spent time relaxing, touring Amish country, checking out what DIY modifications other teardrop owners had done on their rigs, and hanging out with friends. I decided to do a daily quick sketchnote and to go way out of my comfort zone by doing pen-and-ink sketches in my Moleskine. 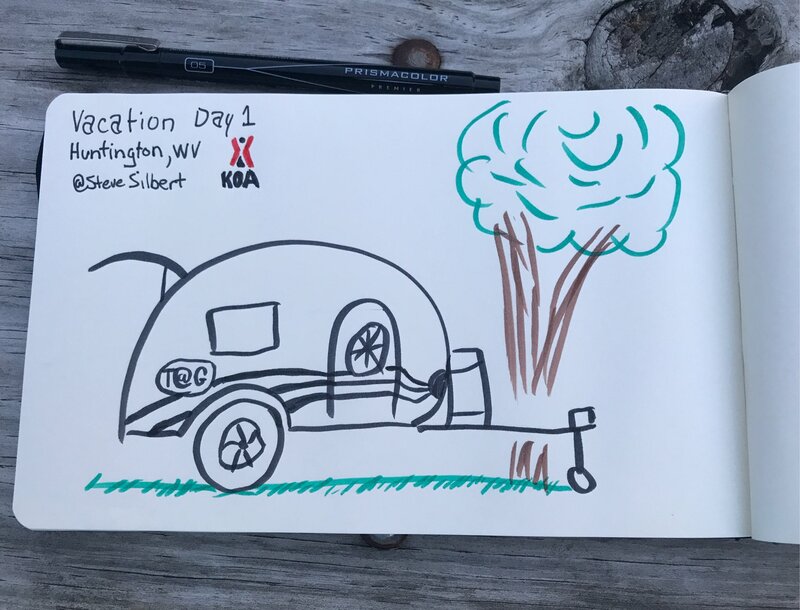 When the daily sketch was complete I snapped a photo and posted on the nuCamp RV facebook group. While not as clean as digital, the errors become part of the vacation experience. It was kind of tough because I didn’t always have a stable surface, but the other campers seemed surprised and happy with the results. 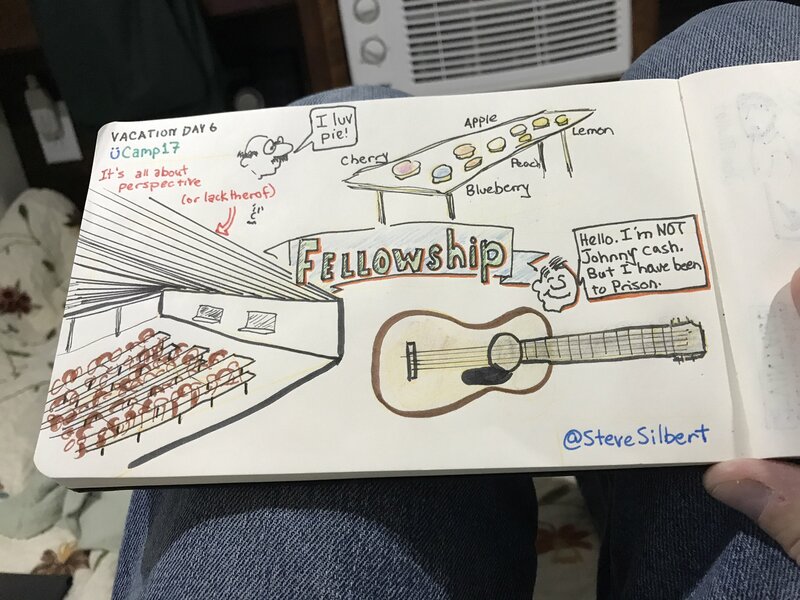 The key to sketchnoting your vacation is the same as with any other sketchnoting. At the end of the day, take a few moments and reflect on those things that were most interesting or had the biggest impact on you. Make a list on scratch paper if that helps. Then, for each item think about a simple visual that is either something you saw, heard, or felt. Rough-sketching on scrap paper is OK. It’s also OK to get ideas by going to the Internet and look up logos and even photos of places you visited. Look at the collection of items and sketches an see if there is a theme or a logical order. Is there an interesting way to connect all of the items? 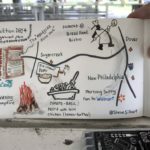 Can you sketch out a map of your day’s travels and place the visuals on the map? 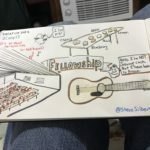 Are there interesting ways to create the sketchnote? 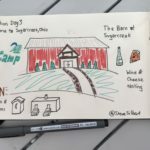 In my case, I forgot my grayscale TomBow markers and needed gray shading for the a day’s sketch where we had a campfire. So I ended up getting some soot from the firepit and using my finger to draw using soot. I find that sketching first in pencil then inking over the pencil works well for me. When I’m done I just erase the pencil marks, leaving a pretty clean piece of paper. I also find that after the paper is clean I can go back an use colored pencil to create light shading that can’t easily be done with pen. 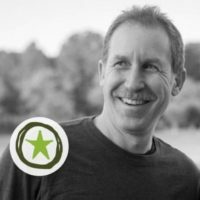 What I’ve found is that the daily reflection very much solidifies the day’s event and learnings in my mind, much like a daily retrospective. That can’t be an accident and also can’t be a bad thing. 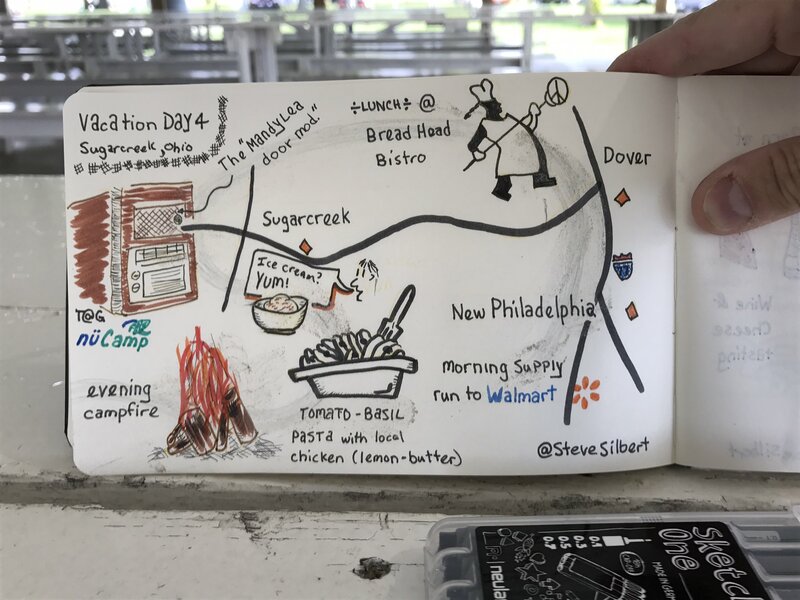 Daily vacation sketchnoting was an interesting experiment for me. I’d like to try it again (I have another camping vacation on the horizon), only next time focus on a single simple image per day.